This week I had a unique and pleasant experience in one of my classes: my 15 year old student become my teacher. It's such a sweet story that I wanted to share it with you. I teach yoga twice per week for a class of teenagers at the Round Rock High School campus. It's a small class with a couple of girls and a handful of boys. The past few months we've been focusing a lot on handstands, headstands, and arm balances because I've found that the students are much more focused and engaged when we work on these challenging poses. Last Thursday I shared with them a video I took of my first attempt at Fallen Angel pose, which is a beautiful and graceful pose that requires lots of strength and courage. In the video, I start out well, but end up falling awkwardly on the floor. My students were really interested in the pose, probably because it is so challenging that even their teacher can't do it. They spent a couple of minutes trying to figure it out and then we moved on with our regular practice. On Monday this week, as I was setting up for class, out of the corner of my eye I caught a glimpse of one of my students, Zach, in Fallen Angel. I was so surprised. So happy. There was so much emotion in the moment. It was clear that Zach had practiced on his own over the weekend to figure out the pose. It was clear that he was focused and working hard. It was clear he had paid close attention to my description of what the pose should look like. After a few minutes our class began. We warmed up with Sun Salutes, then we worked on L-shaped handstands at the wall and headstands. I helped everyone with tips and guidance to be safe and improve their poses. 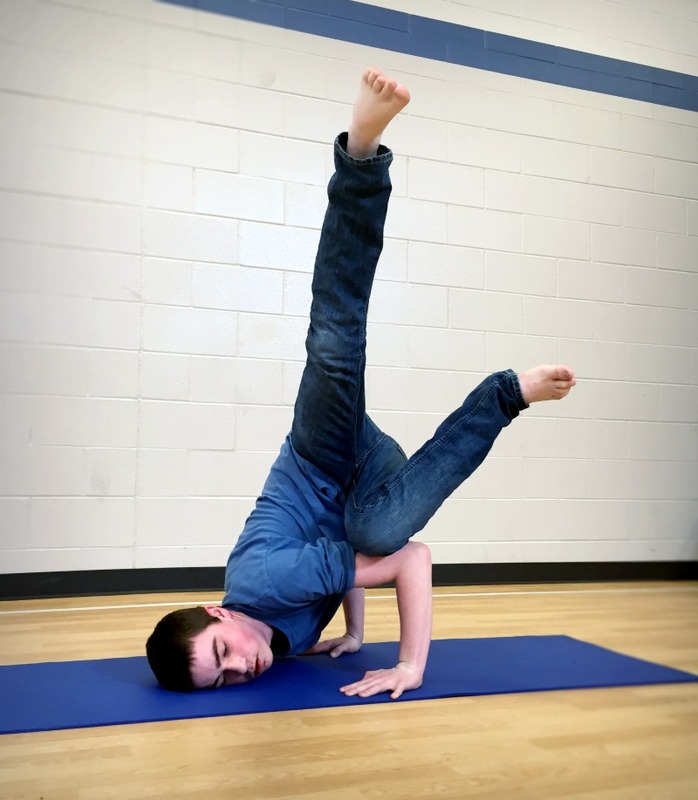 I talked to Zach about how his weight is distributed differently depending on which version of headstand he's doing (whether his hands or forearms are on the floor). He seemed to be half-listening as he continued working on his postures. After class he approached me and out of the blue, quietly offered me a tip of his own. He told me that I need to remember that in Fallen Angel, my hands and the side of my face will be on the floor, so I'll have three supports on which to distribute my weight. In that moment I was simultaneously taken aback, mildly amused, and proud of him for humbly offering his advice, and his interest in helping me, his teacher, with my practice. This kind-hearted, shy, 15-year-old boy unwittingly turned the tables on me and became my teacher, in more ways than one, for a moment that day. P.S. In care you're wondering what my pose looked like, here's a sneak peek. It's hilarious, if I do say so myself.